Using the bathtub and the shower can be a challenging task for a wheelchair user. But with the Padded Drop-Arm Commode every bathtub and shower moment is made super easy. It only takes the user a push of a button to drop the arms and facilitate fast and safe movement from left to right and thus making transfers too easy. That is just the tip of the iceberg, the commode has a lot of incredible features I will share them with you next. The seat is designed not only to ensure your safety, the resilient foam padded back and seat offers you utmost comfort. The Padded Drop-Arm Commode is created to make lateral transfers easy. It is fact that the Padded Drop-Arm Commode will certainly get wet whenever you use it, this is why the padded foam hand grips are made not to get slippery even when wet. 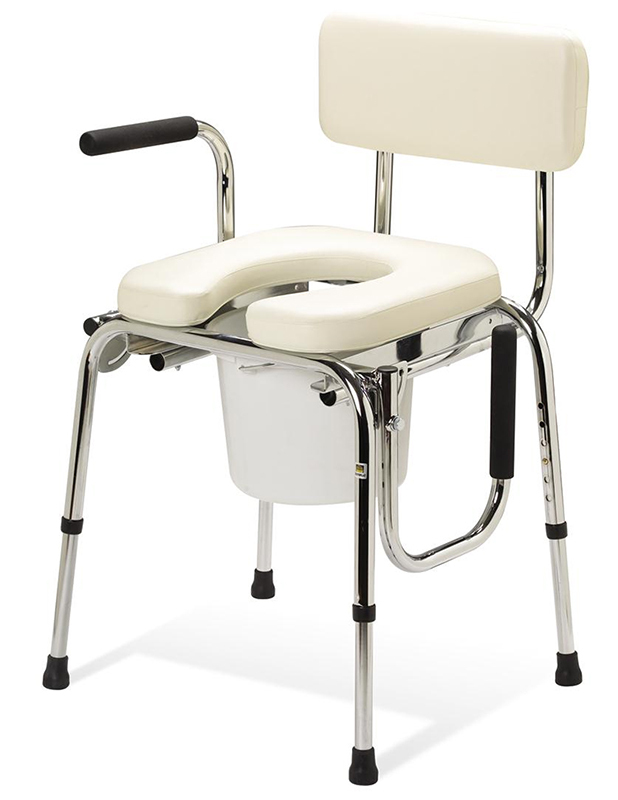 The backrest can be used and the seat mounted on the toilet to offer a fantastic over-the-toilet-safety-frame. The arms drop with the push of a button for unrestricted left-to-right leg movement. The Padded Drop-Arm Commode is stable; you do not need to worry about any tipping off accidents. You will always keep your clean look with the Padded Drop-Arm Commode since cleaning it is a super easy job. The Padded Drop-Arm Commode comes with a lid, pail and a splash guard. It makes it convenient and easy to use. To enhance your safety, you can remove the backrest and use it as a safety frame on your toilet seat. Has a heavy duty construction that gives it durability. The Padded Drop-Arm Commode is heavy you may need help moving it but then you only use it in one place so it is not necessary to transfer it every time. Sportaid offers you this must have product at the best price in the market, and while at it, experience fantastic customer care service from their friendly customer support team. Contact Sportaid today and find quality combined with the most reasonable prices on this and on all of their other products.